In terms of sheer numbers, Granada's iconic Alhambra Palace receives more visitors per year (over two million) than Germany's Neuschwanstein Castle and France's Palace of Versailles. This means you cannot just show up at Spain's shining example of Arabic architecture at any time and expect admittance. Alhambra restricts its capacity to 6,600 visitors daily and because no more than 300 are permitted on the grounds every 30 minutes, reservations are a must. With a little planning ahead there are a few ways to visit the Alhambra that minimise the chances of encountering large crowds and competing with others for the best scenic snaps. 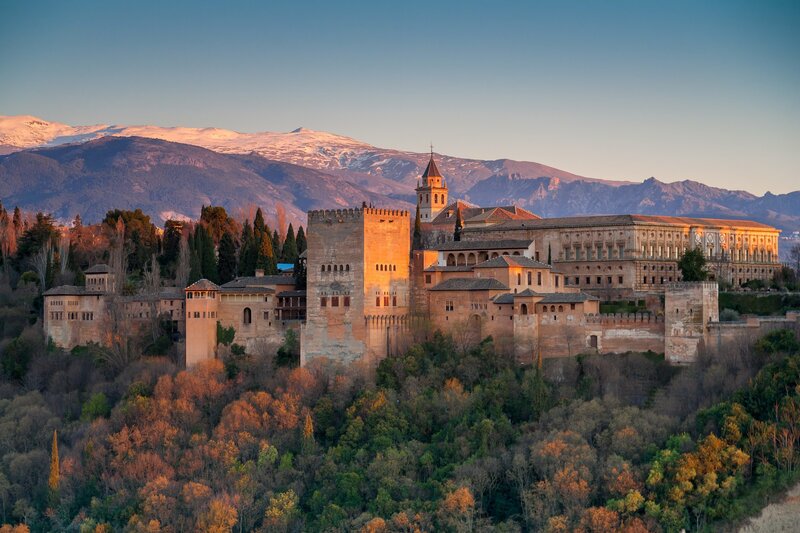 Here are some tips on securing Alhambra tickets and what you need to know before you visit Spain's most popular attraction. The earlier you can reserve a date and time for your visit to Alhambra, the better, because tickets sell out quickly. You may reserve your ticket up to 90 days in advance directly on the Alhambra tickets site or by calling +34 858 953 616. If you buy your ticket online, you'll want to print it before your trip and bring it with you. Visitors who purchase tickets by phone are given a reservation number. Save this number and input it into one of the vending machines at the Alhambra entrance to print your ticket. Most tourists come to the Alhambra to see the Nasrid Palaces, so you want to make sure you choose a ticket option that includes this section. Most visitors buy the General Alhambra Entrance which includes all three sections during the daytime. Reserve your visit so it takes place at 9 AM or after 3 PM; these two times are when visitors at the Alhambra are at their lightest. Spain observes a siesta from 2 PM to 5 PM, so you may find mid-afternoon a quieter time to visit the site. The crowds also slow down a bit in the evening, with a bonus being the chance to see the monument and grounds bathed in light. One downside to visiting at night is not every area of the Nasrid Palaces are accessible. You may also want to avoid visiting Alhambra during the summer season when Spain experiences its hottest temperatures. If you truly want to avoid mingling with a crowd, consider a winter visit. Christmas is a festive time to visit Spain when Granada twinkles with lighting and cafes beckon with hot chocolate and warm churros. If you truly want to skip the queues, there are many available options for guided tours at Alhambra. As with buying tickets for self-guided tours, you'll want to reserve your spot months in advance. One downside to some of the guided tours is that they may rush you through some areas. In order to fully experience the site a minimum of three hours is recommended. Your ticket gives you a 30-minute window to enter the grounds, more specifically the Nasrid Palace as that's the section everyone wants to visit first. It's imperative that you arrive for your appointed visit on time or you'll be turned away. Aim to arrive at Alhambra at least a half-hour before your reserved time. If you choose to walk, be aware that there are some steep inclines on the way to the historic site. A better option is to take one of the bus lines from downtown Granada that travel conveniently to the Alhambra's entrance. At Right Casa, we specialise in helping you find the best property to live in or rent on the Costa del Sol, so you can experience attractions such as the Alhambra and everything Spain has to offer. To learn more about visiting or living in Spain and buying Alhambra tickets, read more posts like this one on our blog.